I teach a modified version of Lucy Calkins' Writing Workshop. I love it. 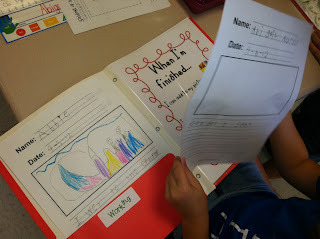 Although I supplement the program, it really turns my 1st graders into confident writers. I think my enthusiasm about writing helps get them motivated. Writing is my favorite subject to teach and my favorite time of day! I enjoy the challenge that writing presents! I am posting to show you the writing folders that I make for my students. I have used both folders and binders over the past 8 years, but much prefer the folders, as they are simple and easy for kids to use. 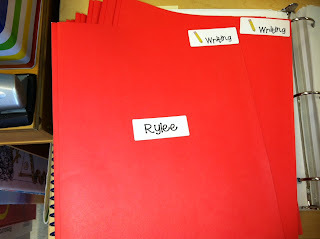 I periodically take the kids' folders home and folders are much easier to take than binders. Also, at the end of each unit, I can quickly remove all writing pieces. I buy bright folders of the same color so they are easy for the kids to spot in their desks. I label the front pocket with "still working" and the back pocket with "finished." I spend a lot of time at the start of the year teaching students about this and how to decide whether they are finished or not finished with a piece. Inside the folder, I put several plastic sleeves. 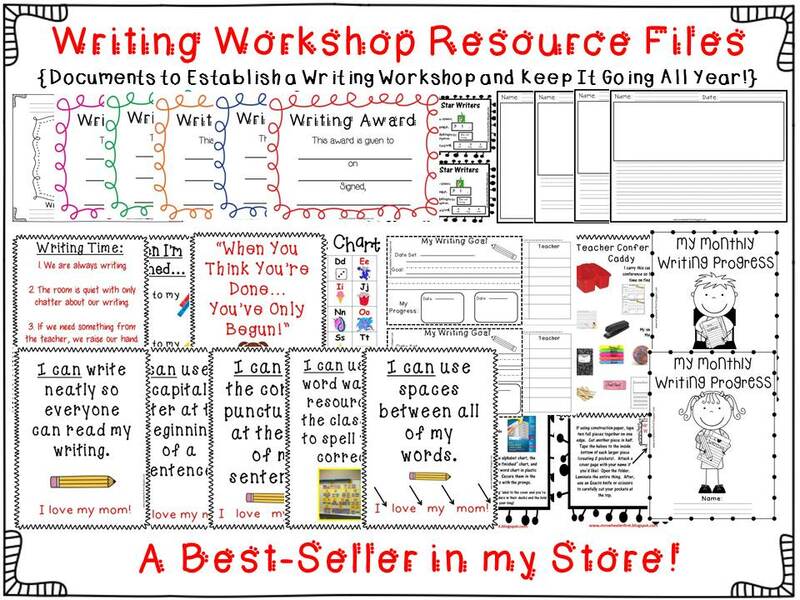 There's an alphabet chart, word lists, and some additional resources, which are included in my best-selling pack shown below. Everything shown plus lots more is included. 180 pages of resources! I also have many writing units for sale including poetry, opinion, revision, writing for others, non-fiction and more! They are all bundled in my set shown below, which you can get at a discounted rate. This bundle will give you approximately one year's worth of writing resources and mini-lessons! Click the picture to check it out! I hope this helps those of you struggling with teaching writing. Writing time is my favorite time of day! Writing is an area I need to work on big time! I'll be stealing this folder idea for next year! What kind of paper do you have your kids write on? I like spiral notebooks becuase they're cheap, but I really like how you set up these folders. Love the folders. Mine are very similar. However, I love the "When I'm done" sheet in their folders. Mine is just a large posted in the class and I feel like the kids never look at it. :( I think I will copy yours next year. Thanks for sharing. I'd love a copy of the papers you put in the folder. Can you upload those too? Thanks again! I spy Lucy Calkin's!!!! :) I'm glad someone else loves her as much as I do! 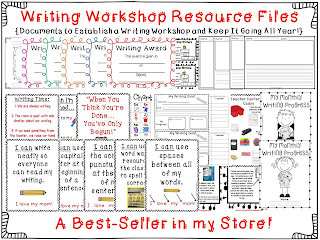 Have you checked out her Reader's Workshop book? It's only $10 and I LOVE it!! Hello. I was on Pintrest and saw this great Teacher collection. Then I saw this blog and thought that perhaps you'd be interested in my latest writing process series. It's eight children's picture books in the Writing is a Process series. Each book introduces, engages and informs students about a different step in the writing process. You can find the books individually on Amazon, Barnes and Noble, etc. or buy them as a bundle on my website, www.terrikelleybooks.com. Libraries and school districts may order them from Ingrams or Baker&Taylor. Please let me know if you need more information.